Nick Iandolo is a Boston-based professional corporate MarComm writer, journalist, and author. He writes articles about pop-culture events such as comic cons, movie reviews, local film and TV industry news, Boston and international travel, and technology blogs. He is currently working on a science-based children's adventure chapter book series. With a little digging and some DIY know-how, you can record Over-the-Air TV with a Personal Video Recorder. Here’s how to do it. The Photo app in iOS is more than just a photo organizer. Find out some of its hidden gems here and master the iOS Photo app in no time. 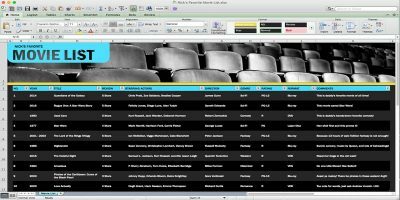 If your movie project is on a shoestring budget, here are 5 free Microsoft Excel templates to help you organize indie film, TV or webisode projects. With a sea of mobile job search apps out there, job searching has never been easier. Here are five of the most popular mobile job search apps you should use. Mission Control is a useful feature in Mac that allows you to organize your Desktop and applications. Here’s how to set up Mission Control in Mac and improve your productivity. Most of the free WordPress themes out there don’t come with a customization option. Here is how you can change the WordPress header image when the theme doesn’t have a setting for it.